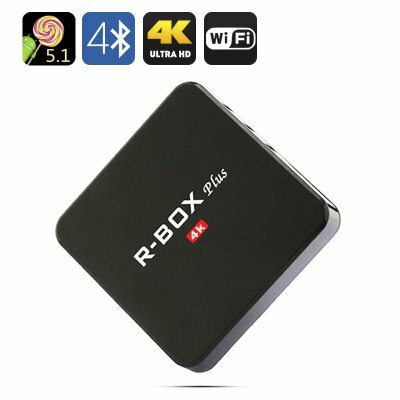 Successfully Added R-Box Plus TV BOX - 4K Resolution, Android OS, Quad-Core CPU, 2RAM, Mali-400 GPU, WiFi, Google Play to your Shopping Cart. Turn your regular television into a smart TV with the R-Box Plus. With its Android operating system this TV box allows you to enjoy all your favorite series, movies, games, and more on your big screen TV at any time of the day. Google Play grants you access to thousands of Games and Apps including Facebook, Youtube, and more while regular Wi-Fi connection allows you to connect to popular streaming websites and on-demand pages such as Netflix. No longer will you have to wait for regular TV broadcastings of your favorite shows and movies – with the R-Box Plus you will be in control of what you'll be watching. Featuring a Quad-Core CPU running at 1.5 GHz, 2GB of RAM, and Mali-400 GPU this TV box can handle all your multi-media demands without dropping any frames. With the latest in line broadcast and media resolutions, 4K, the R-Box Plus is guaranteed to deliver you a phenomenal media experience, allowing you to enjoy all your movies like never before. With its sleek design this TV box is a true asset to any media loving household. Sit back and relax after a long day at work while watching your favorite series, or enjoy a lovely movie with the family during the weekend – with the R-Box Plus unlimited hours of fun and entertainment lay right in front of you. This R-Box Plus comes with a 12 months warranty, brought to you by the leader in electronic devices as well as wholesale Android TV Boxes..